The term "conjugal rights" has long characterized ways of speaking about marriage both in the canonistic tradition and in the secular legal systems of the West. This book explores the origins and dimensions of this concept and the range of meanings that have attached to it from the twelfth century to the present. Employing far-ranging sources, Charles Reid Jr. examines the language of marriage in classical Roman law, the Germanic legal codes of early medieval Europe, and the writings of canon lawyers and theologians from the medieval and early modern periods. The heart of the book, however, consists of the writings of the canonists of the High Middle Ages, especially the works of Hostiensis, Bernard of Parma, Innocent IV, and Raymond de Pe afort. 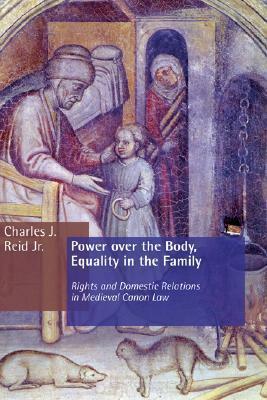 Reid's incisive survey provides a new understanding of subjects such as the right of parties to marry free of parental coercion, the nature of "paternal power," the place of bodies in the marriage contract, the meaning and implications of gender equality, and the right of inheritance." The term bconjugal rightsb has long characterized ways of speaking about marriage both in the canonistic tradition and in the secular legal systems of the West. This book explores the origins and dimensions of this concept and the range of meanings that have attached to it from the twelfth century to the present.Employing far-ranging sources, Charles Reid Jr. examines the language of marriage in classical Roman law, the Germanic legal codes of early medieval Europe, and the writings of canon lawyers and theologians from the medieval and early modern periods. The heart of the book, however, consists of the writings of the canonists of the High Middle Ages, especially the works of Hostiensis, Bernard of Parma, Innocent IV, and Raymond de Penafort. Reid's incisive survey provides a new understanding of subjects such as the right of parties to marry free of parental coercion, the nature of bpaternal power, b the place of bodies in the marriage contract, the meaning and implications of gender equality, and the right of inheritance.